CLICK HERE TO DOWNLOAD JIM AND THEM #164 PART 2 RIGHT HERE! People Roll In Packs? : Is it a thing where people like to roll with people that dress the same as them? 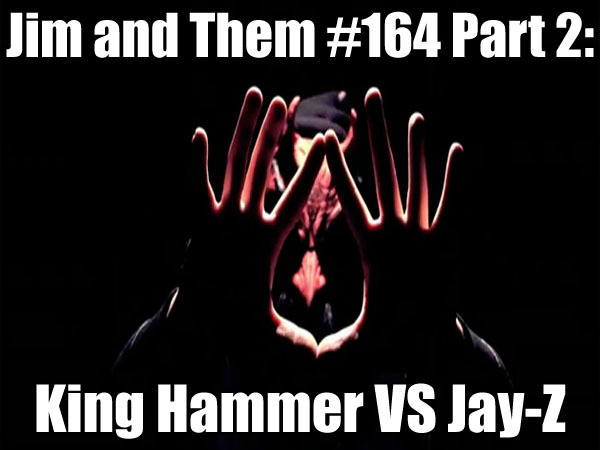 MC Hammer vs. Jay-Z: King Hammer is back to take on ILLUMINATI DEVIL WORSHIPPER JAY-Z! Midday News Breakdown: How many things can go wrong in one minute? Well a hell of a lot! EASTBOUND AND DOWN!, MOJO SO DOPE!, KID CUDI!, POUR YOUR HEART OUT!, YO!, HEART AND SOUL!, EDEN!, MIKE!, UPDATES!, WENDY’S GIRL!, ARBY’S GIRL!, SAVED BY THE BELL!, HEART NECKLACE!, CAREFUL WHAT YOU WISH FOR!, ACCESSORISE!, RACES!, MULTICULTURE!, TOKEN!, OMAR!, GHOST WRITER!, MC HAMMER!, JAY-Z!, RUN!, ILLUMINATI!, DEVIL CLUBS!, SO APPALLED!, DIAMOND!, PUN!, MTV’S TOP 10 HOTTEST MCS!, EMINEM!, WACKA FLOCKA FLAME!, BUSTING AT EM!, GOING HAM!, G-CHECK!, BORDER CROSSING!, NEWS MESS UPS!, TELEPROMPTER!